Jesus College May Ball certainly made a stellar first impression. Under a shimmering network of fluorescent lights which made the trees glow pale violet and electric turquoise, my friends and I gazed around us in awe, with prosecco and salted caramel brownies in hand. We’d envisaged this ball as the brightest star in the May Week firmament: our expectations were higher than the sun, and Jesus did not disappoint. From first launch and the piquant sips of themed cocktail Cosmicpolitan, to the touchdown of Scouting for Girls and their nostalgic noughties throwbacks, Jesus offered us an all-star night to remember. At first glance, ‘Aurora’ does not exactly stand out on a list of 2018 may ball themes. ‘Planetarium’ at Clare and ‘Music of the Spheres’ at King’s typify a common inclination this year for the galactic and unearthly. However, the Jesus ball committee chose wisely as their theme had special resonance for the College. As dusk became darkness, Second Court was lit up by a display of enchanting projections in honour of pioneering Astronomer Royal and Jesus alumnus John Flamsteed. Guests drifting through an ethereal, pastel-tinted haze were presided over by luminous Capricorns dancing on the walls and a vast, god-like Orion. 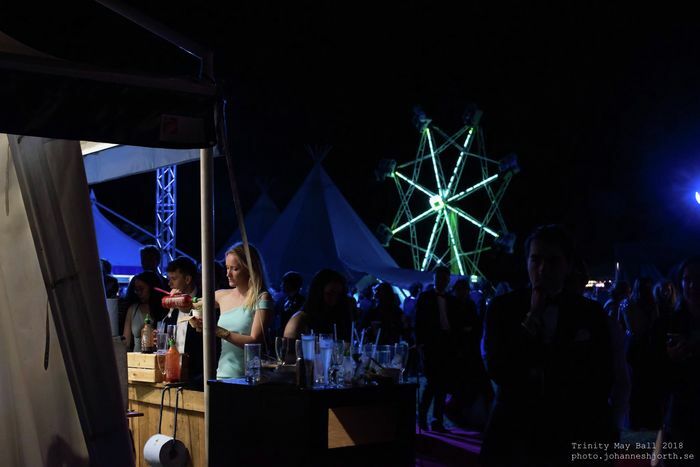 Alongside the may ball staples of the photo booth and silent disco, tarot card readings were an original and extremely popular addition to the ents lineup. The theme even extended to an orbital one-way system between areas; this kept congestion to a minimum and ensured each small step became a giant leap to a new, atmospheric space clearly mapped out with titles like ‘Supernova’ and ‘The Milky Way’. Of course, it goes without saying that jumping up and down to ‘She’s So Lovely’ was sheer tweenage guilty pleasure, particularly after a few of Aromi’s heavenly gelato cocktails. Another highlight was the ABBA tribute band – the intimate second stage Ursa Minor was overflowing with joyful dancing queens and mans after midnight. For those who preferred to sit back and take in the spectacle, food and drink were served late into the night. The fare included delicious treats such as halloumi fries bejewelled with pomegranate seeds, wholesome falafel pitas and indulgent Belgian waffles drenched in chocolate sauce. The bacon rolls offered to guests on their way to the survivor’s photo also provided a rejuvenating boost, the perfect way to round off the revelries of Monday night and to mitigate the hangover of Tuesday morning. From such thoughtful touches, to the exquisitely realised theme and stunning attention to detail which had clearly been put in to each and every element, Jesus was everything I hoped it would be and more. The planets aligned: this faultless ball was truly out of this world.